We’re pumped. My new preview is out. Give it a look! If you’re looking for a funny motivational speaker for YOUR event or meeting, we hope this pushes you over the top. Looking for a motivational speaker (who speaks on happiness) for your event? Contact me here. https://www.bradmontgomery.com/wp-content/uploads/2018/11/logo-1-495x198-1-300x120.png 0 0 admin https://www.bradmontgomery.com/wp-content/uploads/2018/11/logo-1-495x198-1-300x120.png admin2012-07-22 11:28:392012-07-22 11:28:39New Happiness Motivational Speaker Preview is Out! Sad Sack just made crappy decisions. Well, turns out, that’s not entirely true. Turns out, actually, that we have more control over our attitude than we ever thought. Who says? Social Psychologist Sonja Lyubomirsky says, that’s who. And just who is Sonja Lyubomirsky, and why does she think she knows so much? Because she’s Dr. Sonja Lyubomirsky, Ph.d., researcher at Stanford University, super-smarty-pants, recipient of numerous grants from the National Institute of Mental Health, and author of the book, The How of Happiness: A New Approach to Getting the Life You Want (Penguin Books 2007). And it’s not just her. Many social psychologists have studied the mystery surrounding what it is that exactly makes us happy, or un-happy as the case may be. Dr. L’s bibliography in her book is 45 pages long! That’s a lot of books, articles, speeches and research on the how’s and why’s of happiness. Genetic predisposition. Yep, you got it. A person’s genes (and not the 501 kind either) sets out his or her baseline on the Happy-o-Meter (a highly technical piece of scientific, specialized, calibrated, opinionated measuring equipment). Dr. L. says that 50% of a person’s contentment comes from their parents, and their grandparents, and their great-grandparents, and on and on—and not in the way you think, like the nagging, the guilt, the “I just hope you’re wearing clean underwear,” kind either. (What’s with all the underwear references, anyway?). In other words, your inherited temperament or personality does account for 50% of your happiness. Life circumstances. You know what these are. How much money you have; what kind of family were you born into; how good or not-so-good is your health; do you have a sick spouse, or naughty children; whether you live on top of a Superfund site; whether your underwear is clean (just kidding); you know, those kinds of things. Turns out “those things” have direct impact on how happy we are, but not, interestingly enough, a lot. These mostly out-of-our-control type of life circumstances have an approximately 10% impact on our happiness level, says the Happy-o-Meter. How we think and what we do. That’s the final thing. Our attitude. Our thoughts. Our outlook. If you’ve been doing the math, it turns out that 40% of our happiness is dependent upon our attitude. But guess what? Dr. L says, things settle over time. People can be wildly unhappy or happy for moments in time, but after a while they settle and their happiness level goes back to baseline. Even if they win the $10 million. Even if a satellite crashes into their backyard ruining the newly installed patio. Or even if their chihuahua falls into a pothole and has to be retrieved by a fireman. So what does this mean? Well, for one thing, turns out your grandma was right: you can turn your frown upside down. (Grandma would have been awesome in the workplace.) You can listen to reggae: Don’t worry. Be happy. You can adjust your attitude almost as much as you can adjust your underwear. (I can adjust my underwear 40%, no problem.) Right now if you want to be happy, remember how much is up to you. Stop whining. Start smiling. Focus on what you do and how you think. Not rocket science. Common sense. And guess what else? If you’re going through a difficult time, a tragedy, a medical crisis, or fielding any of the rotten tomatoes life throws, knowing that you can control your response to it helps. You will get through it, you will heal, and you will rise back up to your average norm for happiness. It’s your response, your willingness to hit that Reset Button on the Happy-o-Meter, that really counts. Extra Credit Question: What are you doing with your 40%? Are you making the right choices? Our control is greater than we would guess. Get up and start being happy now. Book Brad to speak at your meeting, convention or event. — He’s a happiness speaker; and he’s funny. 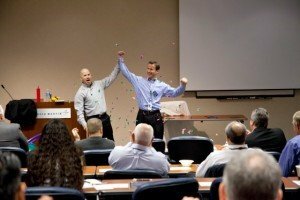 Are you looking for a motivational speaker who speaks about happiness and who gives specific tools and strategies for boosting your psyche, then consider Brad Montgomery, controller of his own 40%. He’s the only happiness speaker he knows. Looking for a Funny speaker who is motivating AND is an expert in how to be happy at work? for your event? Contact me here.